SHANGHAI: The easing of China’s one-child policy was a godsend to Zhang Yinzhe and his wife Xu Mengsha, who had decided they wanted to use in-vitro fertilisation (IVF) to freeze an embryo in the hope of one day having a second child. But most IVF procedures are restricted in China to couples who are infertile, and surging demand at overwhelmed reproductive clinics since the policy was relaxed two years ago would anyway have meant months of waiting. So the Beijing couple flew to Thailand, part of a wave of Chinese spilling overseas into Southeast Asia, the United States, and elsewhere in a test-tube baby boom. “There is an old saying in China: a son and daughter complete the family,” said Zhang, a 31-year-old airline pilot. Zhang spoke after a consultation at Bangkok’s Piyavate Hospital, its walls festooned with Mandarin-language posters on IVF as other Chinese patients waited their turn. Definitive numbers on China’s share of the assisted-reproduction tourism sector are unclear, but its spending was estimated by the state-linked Qianzhan Industry Research Institute to have grown 22 percent annually to $1.4 billion in 2017. Further rapid growth is expected. Overseas clinics are adding Mandarin-speaking staff, Chinese-language websites, and increasingly marketing to Chinese seeking a second or even third child. Chinese figures estimate that 90 million women became eligible for another child once the family-planning policy was relaxed, and more second children were delivered last year than first-borns. But Chinese couples are increasing having children later, past their reproductive primes, and may require help from science. Around 12 percent of the childbearing population are unable to conceive naturally, according to Chinese studies, yet China only has about 400 licensed IVF clinics, where waiting lists can approach one year. IVF involves combining egg and sperm in a lab and implanting any viable embryos into the womb. The one-child policy caused birth rates to plummet, and China eased it to ensure a big enough future workforce to support its fast-aging population. But it still bans or restricts fertility options like egg donations, surrogate motherhood, gender selection, and freezing embryos for later use partly over fears that opening the floodgates could spark a population explosion. Only around 500,000 Chinese IVF procedures took place in 2016, health officials estimate, far short of what fertility doctors say is required. “There is big demand in China, but we can’t handle it here,” said Ri-Cheng Chian, director of reproductive medicine at Shanghai’s 10th People’s Hospital. So Chinese are booking tickets to Thailand, Malaysia, Cambodia and even Russia. IVF treatments cost around 30,000 yuan ($4,700) in China, but can be several times that abroad, where many Chinese feel they can find higher-quality care. Zhang, the pilot, wants IVF partly to screen for genetic defects, something restricted at home. “That’s a lot of money for a Chinese family but compared to the health of my next generation, I should spend it,” he said. 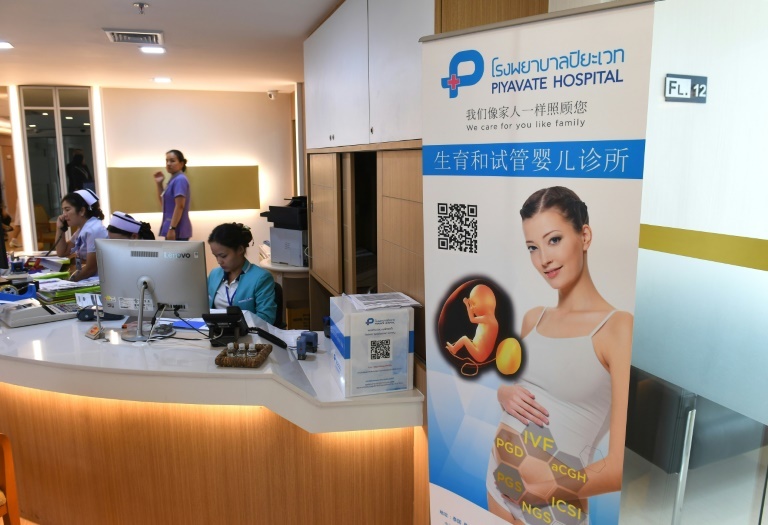 Chartree Saenghiranwatana, a fertility specialist at Piyavate, said the clinic has been “getting increasing demand from Chinese patients the past year or two”, and is recruiting Mandarin-speaking doctors and nurses. Some Thai clinics say up to 80 percent of their customers are Chinese. “A new industrial chain is forming, for reproduction, in Southeast Asia,” said Wei Siang Yu, the Singaporean founder and chairman of Borderless Health Group (BHG). BHG has created a video-conferencing platform on which Chinese patients can consult fertility experts around the world, aided by Mandarin-speaking interpreters. BHG is also establishing sperm and egg banks in countries including Thailand, Australia and the United States, primarily for Chinese clients, complete with a phone app allowing them to monitor their “fertility assets” almost like a bank account. Yu said two years ago Chinese patients placed sixth or seventh in the ranks of foreign patients coming to Thailand for medical tourism, but will be the largest group this year. Besides infertility or the desire for a larger family, the Chinese preference for male heirs sends some couples abroad in search of clinics that will perform gender screening — though that is technically illegal in most countries — and Chinese LGBT couples are also packing their bags. Li Na, who is from central China, went through expensive IVF procedures in Shanghai, Hong Kong and the United States. All failed. But she and her husband hit the jackpot in Thailand, and now have twin girls through a surrogate mother there and a boy through IVF. Li, 41, has parlayed the experience into a side career as a consultant to other Chinese couples seeking the same joy she felt.